Cooking instrument used to barbeque and grill foods. Various types of grills abound from small to large, but all come equipped with an open grid above and a heat source below. The major differences in the operation of grills lies in the heat source - gas, charcoal or electricity. 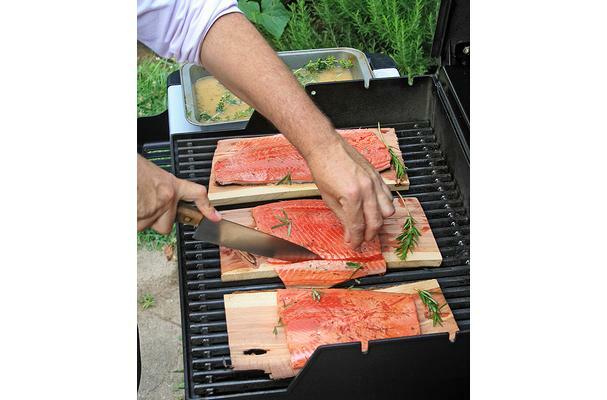 Some grills are also designed to burn woods underneath the grid so that food can be infused with wood flavors such as hickory, cherry and mesquite. Grills should be operated with caution and cleaned often as high temperatures can easily start a grease fire. Many grills have low to high temperature zones which allows for several types of food to be grilled at once.